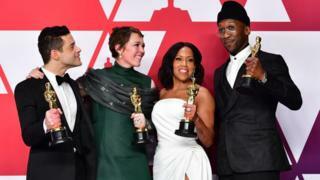 The first Oscars to go ahead without a host since 1989 was an unqualified success - the best ceremony in years, packed with memorable moments and for (nearly) all the right reasons. Without the need to fit in all the monologues, skits and handovers that are the mainstay of a host's work, time was available for far better speeches and emotional punches; the announcing of a winner given a precious few extra seconds for its meaning to really take root. Kevin Hart's decision to take himself out of the hosting duties following the resurfacing of homophobic tweets had initially presented the Academy with a huge problem. Which Oscars outfits have caused a stir? Who was a big enough name who had so little troublesome material in their back catalogue that they, too, wouldn't feel a Twitter backlash the moment they were announced? So the Oscars went hostless for the first time since the disastrous 1989 show, regarded as the worst in history - though this actually was nothing to do with not having a host; the awfulness was down to some badly misguided song-and-dance routines. The first was to get Tiny Fey, Amy Poehler and Maya Rudolph to effectively do the traditional opening monologue (after an opening performance from Queen, which got most people mildly waving an arm around, in a we've-not-really-had-enough-to-drink-yet-but-OK kind of way). Fey and Poehler had hosted the Golden Globes before and had been tipped as potential Oscars hosts; this was near-as-dammit them doing it, except they (with Rudolph) did a show's worth of material in two minutes. "We're not hosting, but if we were, these are the jokes we would make" was their take. It was very post-modern but it really worked. They raced through so many references - to Netflix; to Fyre Festival; to Donald Trump's wall; to the show's chaotic recent months and the wrangling over taking out awards - it was hard to keep up. "We won't be doing awards during the commercials, but we will be presenting commercials during the awards," said Poehler. "So if all the winners could all say Hellman's Mayonnaise: We're on the side of food instead of their speeches, that would be great." It's usually actors who do this, of course - but this time around, Serena Williams, Trevor Noah and Tom Morello from Rage Against The Machine all got a go. It even meant that Mike Myers and Dana Carvey could reprise their roles as Wayne and Garth from Wayne's World. Awkward moments - such as the make-up crew from Vice struggling desperately to read their speech - came solely from the award winners. But the good moments - of which there were many - were allowed to breathe and stand out so much because they weren't rushed in order to fit the meaningless skits that exist just to give the host something to do, like when Jimmy Kimmel brought in a busload of tourists to confusedly mill around the Dolby Theatre. So when Lady Gaga and Bradley Cooper sang Shallow together, the camera could linger on them as the song finished rather than rushing off - thus providing an iconic Oscar image for years to come. And there was also the sheer joy when - a minute after having to hold his nose with the Green Book award, Samuel L Jackson got to give best adapted screenplay to BlacKkKlansman's writer "Spike LEEEEEEEEEEEEEEE!" It was Lee's first win at the fifth time of being nominated. He made the most overtly political speech of the night: "The 2020 presidential election is around the corner. "Let's all mobilise. Let's all be be on the right side of history. Make the moral choice between love versus hate. Let's do the right thing." Javier Bardem spoke - in Spanish, with subtitles, a first - of how "there are no borders or walls that can restrain ingenuity or talent". Chef Jose Andres spoke of "immigrants and women, who move humanity forward". Meanwhile, the one thing that went unmentioned was the name of Bohemian Rhapsody's director, Bryan Singer - currently the subject of claims that he has sexually abused boys and men; claims he has denied.